This article demonstrates using div elements to effectively to build websites without using table elements on a page. Because there are a number of advantages to the div element most clients ask designers to develop websites using div elements rather than table elements. The code below is for beginners learning to use div elements to develop websites. The following explains why to use DIV over TABLE elements. Pros of Table Element: Most designers use table for a consistent look. Tables are also easy to maintain. Another advantage of table is that it is compatible with the most browsers. Cons of Table Element: All this comes with a cost: Too many nested tables increase page size and download time. More table elements push important content down so search spiders are less likely to add content to search engines. Pros of DIV Element: div with CSS we can achieve the same table based page structure and reduce the number of elements on the page, which allows the page to load faster. It also makes page more compatible with search engine spiders. Cons of DIV Element: The major drawback of this is not all CSS elements are not browser compatible. Because of this we have to write some custom CSS to resolve issues. I have created one simple application which shows how easily you can create you own pages with div elements only. The following diagram demonstrates the layout of div elements. Here is a list of the style sheet classes I have created for the page layout. Let’s get into more detail. divHeaderRow: Class assigned to the div element which works as header row of table. As height of header image is fix to 105 row having height element value 105px. divHeaderColumn: Class assigned to div element which works as header column of the table. 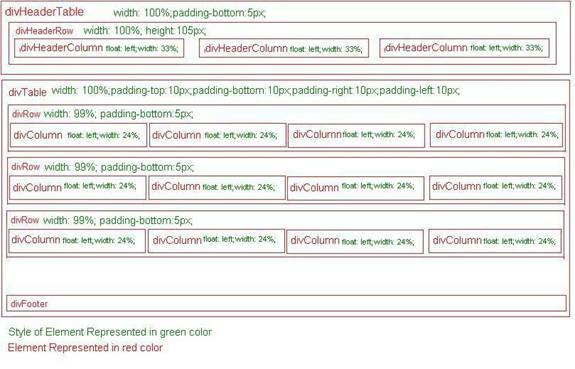 As header part is divided in three part the width element having value 99%. divTable: Class assigned to the div element woks as the table in container part of html document. divRow: Class assigned to the div element woks as the row in container part of html document. divColumn: Class assigned to the div element woks as the table in container part of html document. As container form element are 4 per row the width element having value 24%. Following is HTML code of the page which shows how the classes assigned to the elements. <img alt="Offshore Outsourcing software development company India"
title="Offshore Outsourcing software development company India"
This not the only structure you can create with div and CSS so you can achieve different layouts with this also. So from the above example you can see the div layout with CSS is easy and powerful. Because of this web pages download faster, avoid using more tags, and create web pages that are more appealing to search engines.